Went to a CAST lunch meeting yesterday – always a nice time, and good to mingle with other communications professionals, but the freelance market here is a tough one and I’m afraid I’m not a great schmoozer. But I’m still looking for design work, if anyone’s interested! Hoping to finish “Eddie and the Blue Eggs” today, before I head for Ithaca for my singing gig with Diamonds in the Rough. Here’s what “Eddie…” looked like at the end of the day yesterday – two coats of workable fixtif so far, as I layer colors and the substrate loses bite. The fixatif really stinks up the house – not just my second-floor studio – despite the window fan I spray next to (fan blowing out of the window, of course), but yesterday was warm enough that I could spray it outside and let the fumes dissipate before bringing it back in. I’d sure love to find a non-toxic, non-aerosol way to do this! 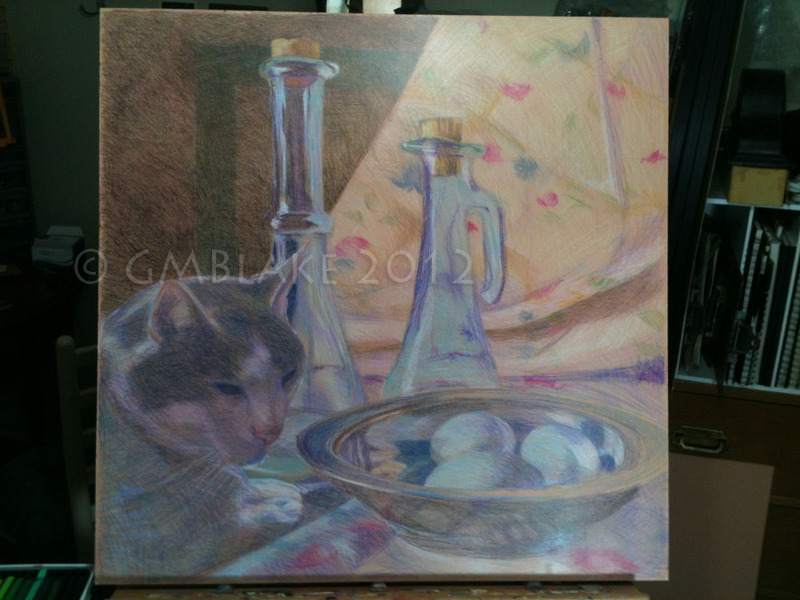 More work needed to darken the far background, pull up details in the glass cruets, and reconcile the shoulder with the facial colors of the cat. Also need to do a little work on the drape, but I don’t want to lose all the spontaneity by overworking!